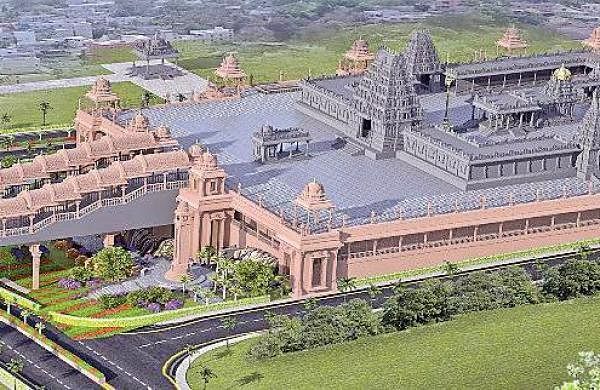 BHADRACHALAM: The temple town of Bhadrachalam wore a festive look as Sita Ramachandraswamy temple authorities, as well as the district administration, made elaborate arrangements for the Sita Rama Kalyanam. The kalyanam, the celestial wedding of Lord Rama and Goddess Sita Devi, will be performed at the Midhila Stadium from 10 am to 12.30 pm on Sunday. Thousands of devotees have started arriving in the temple town on Friday morning and the authorities are expecting more than two lakh devotees to witness the Kalyanam and Pattabhisekham on 14 and 15 April respectively. As part of the preparations, the temple and its surroundings have been illuminated with colourful lights and several pandals have been erected at Vista Complex, bathing ghats and in many places in the town to provide temporary accommodation to devotees. The kalyanamandapam where the kalyanam will be performed has been decorated with colourful flowers as well as mango and coconut leaves. While the district administration has conducted several meetings with the officials of various departments to make the necessary arrangements, panchayat officials have deployed additional sanitation staff from Rajahmundry to keep the town and temple premises clean. The temple officials have spent Rs 1 crore for arrangements and prepared two lakhs additional laddu prasadam to meet the devotee’s demand. This time the temple officials have increased ‘talambralu’ distribution counters from 25 to 35 for the convenience of the devotees. The officials have decided to keep three quintals of ‘talambralu’ at each counter. Meanwhile, the Public Health Department has set up drinking water taps in many places in the town and the temple officials have made arrangements to distribute drinking water packets among the devotees at the kalyanamandapam. Meanwhile, Temple EO T Ramesh Babu said all arrangements are in place for event, while adding that in view of the model code of conduct Chief Minister K Chandrasekhar Rao was invited for the kalyanam but invited the chief secretary.